A note about names: Chorus Frog or Tree Frog? The Pacific Chorus Frog can be distinguished from all other frogs within its geographic range by two characteristics: 1) the presence of toepads, and 2) a dark stripe that extends from just before the nostril, through the eye, and past the tympanum (ear). 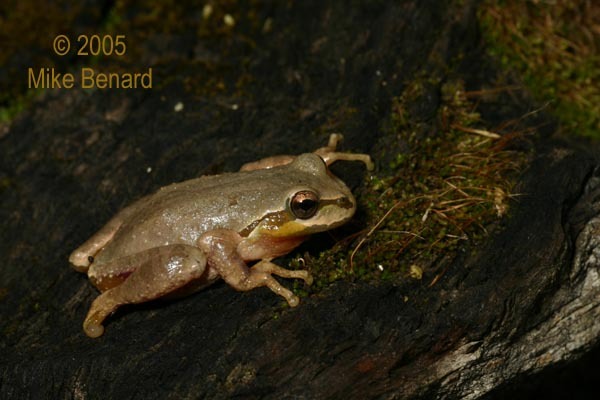 No other frogs found within the geographic range of the Pacific Chorus Frog have both of these characters (Stebbins 2003). 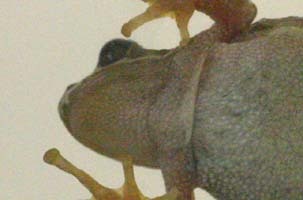 Adult pacific treefrogs are generally 3.0 to 4.5 cm (1 to 2 inches) long. On average, females are larger than males. During the breeding season, males can be distinguished from females by the color of their throats. Females have a smooth, white throat, while males have a dark brown or yellow throat with wrinkly skin. A striking diversity of skin colors and patterns can be found among pacific chorus frogs. The most typical colors are brown and green, but in some cases frogs may also have a reddish coloration. Some of the color variation is due to genetic differences between individuals. In the 1960's, Resnick and Jameson (1963 Science) mated different color combinations of male and female pacific chorus frogs, and examined the color patterns of the resulting offspring. Their results suggested at least two genes were involved in producing frog colors. Further, red color appeared to be a recessive trait while brown color appeared to be a dominant trait. But genetics are not the only factor affecting frog coloration: environmental conditions matter too. It turns out that some individuals can change color between green and brown (Wente and Phillips 2003 American Naturalist). The existence of diverse coloration and patterns makes pacific chorus frogs delightful to observe. But this diversity also raises the question of whether color patterns have any adaptive value. Do these color patterns help the frogs survive or reproduce? A paper published by Stephen Morey (1990 Journal of Herpetology) addressed this exact question. Morey kept green and brown pacific chorus frogs in cages in the laboratory, and conducted two experiments. In the first experiment, he gave the frogs a choice between hiding on a green background or a brown background. The frogs were much more likely to sit on a matching background (e.g., brown frogs were more likely to sit on a brown background than green frogs). This suggested the frogs were trying to hide from potential predators. In the second experiment, Morey put frogs in a large chamber with a garter snake. The background of the chambers were painted brown or green. He found that the snakes were much more likely to attack the frog when it was a different color from the background. Despite these interesting experiments, the overall ecological and evolutionary significance of pacific chorus frog color patterns is still not well-understood. With the many genetic tools available now, identifying the specific genes involved in color patterns is now possible. It is also not clear if the color patterns have any other function beyond avoiding predation. For example, could color pattern affect the ability of frogs to thermoregulate? Could the color patterns be involved in some aspect of mate choice? Slow series of advertisement calls. Rapid series of advertisement calls. These calls were recorded in 2003 at the UC Quail Ridge Reserve. Pacific Chorus Frogs have a prolonged breeding season that can last for several months. In Napa County, I have observed them breeding from January until May, although the breeding peaks in February and March. Most breeding occurs at night. During the peak of the breeding season, huge numbers of males may gather on the same nights, creating an incredible din. Because Pacific Chorus Frogs are common in southern California, the sound of these choruses has been played in the background of many Hollywood movies. An amusing consequence is that you can hear pacific chorus frogs calling in the background of movies set far outside their geographic range. During these breeding choruses, males sit near the water's edge, and use different types of vocalizations to communicate with other males and females. Many people are familiar with the Pacific Chorus Frog's 'advertisement' call, which consists of a two-part 'Kreek-eeck' sound. The primary function of the advertisement call is to attract mates. As male Pacific Chorus Frogs make advertisement calls, female Pacific Chorus Frogs approach and select their mate. Mate selection is not a random process; female Pacific Chorus Frogs prefer to mate with males that make advertisement calls more frequently than the other males (Whitney and Krebs 1975 Nature). Additionally, larger male frogs are more likely to mate with female frogs than smaller males. Why larger males are more likely to mate than smaller males is unknown. It may be because they produce more attractive calls; alternatively, larger males may be more successful in fights with other males. 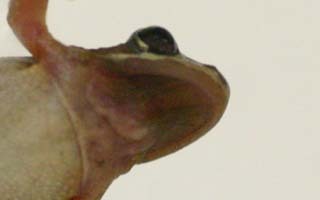 Aggressive interactions between adult male Pacific Chorus Frogs are common. During these interactions, males use a second type of call: The 'encounter' call. The encounter call, which is a trilling sound, serves as a warning when another male gets too close. The intruder will often retreat in response to the encounter call. Sometimes both males will make encounter calls until one retreats. Occasionally, there is a brief physical altercation before one frog retreats. While the encounter call can serve as a useful signal,there are drawbacks to using it; female Pacific Chorus Frogs are not attracted to the encounter call (Brenowitz and Rose 1999 Animal Behaviour). Pacific chorus frog breeding groups can be quite chaotic. On warm (~50 F or 10 C), humid nights, many males can be calling. As the breeding area becomes more crowded, encounter calls begin to get mixed in with advertisement calls. 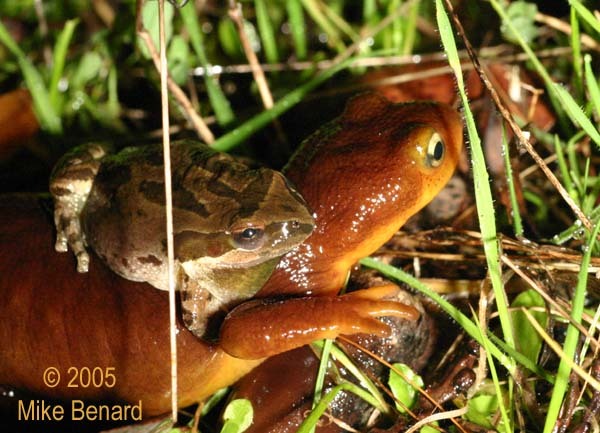 The males will often attempt to mate with any non-vocalizing amphibian that gets too close. This includes not only male Pacific Treefrogs, but other species of frogs, and even salamanders! 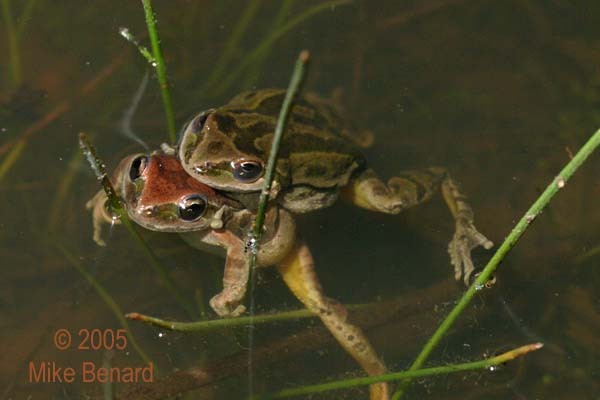 A mating pair of pacific chorus frogs in amplexus. The male is clinging to the back of the female. In the midst of all of the chaos at the breeding site, females find their way to males. When a female approaches a male, the male will move onto her back, and grasp her under her forelimbs with his forelimbs in a position known as "amplexus". The female will then swim out into the water to lay eggs on vegetation, debris and other structures. As the female lays eggs, the male will release sperm to fertilize the eggs. A single female frog can lay 500 to 1,250 eggs in a year (Wright and Wright 1933). The eggs are generally laid in multiple small clusters, each containing from one to over 100 eggs. 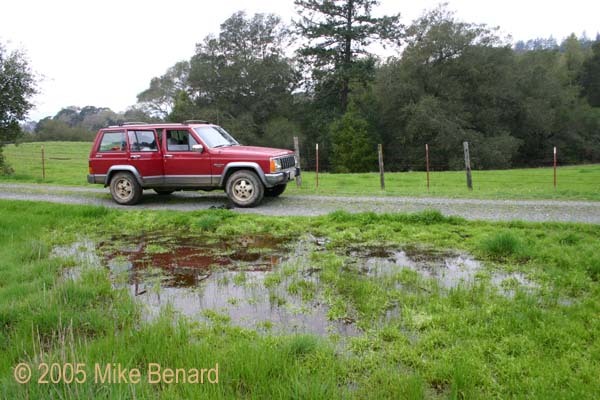 A shallow puddle in Napa County, CA, where Pacific Chorus Frogs bred. In February this puddle was full of eggs. However, it dried long before any of the tadpoles could escape the puddle by metamorphosing. 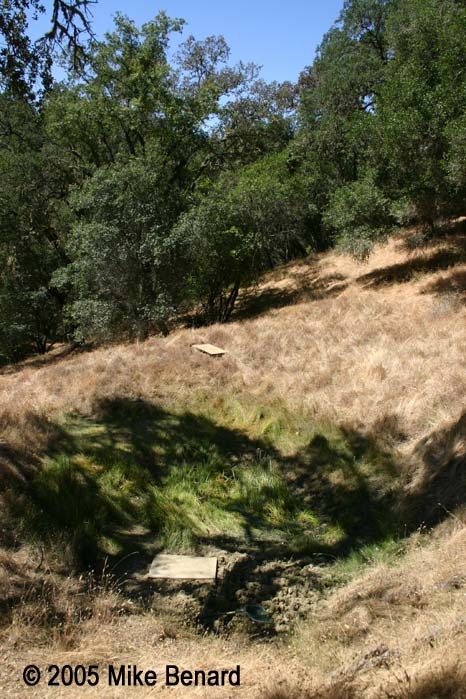 An ephemeral pond in Napa County, CA, where Pacific treefrogs breed. This photo was taken in February when the pond was at its deepest. 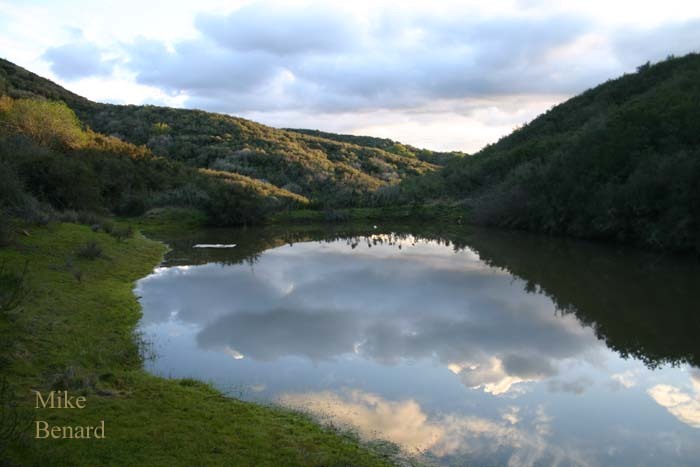 Predators of Pacific Chorus Frogs at this pond include predaceous diving beetles, giant water bugs, and garter snakes. 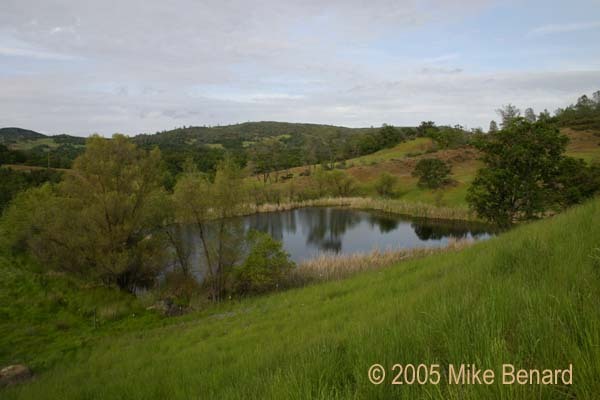 A permanent pond in Napa County, CA, where Pacific treefrogs breed. This pond contains predatory invertebrates, such as odonate nymphs, as well as large centrachid fish like bluegill sunfish. 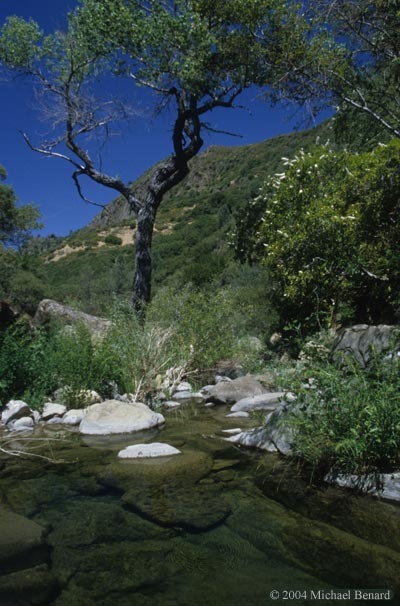 LEFT: Small ephemeral stream in California's coast range where Pacific Treefrogs breed. This habitat is also used by California Newts (Taricha torosa) and Foothil Yellow-Legged Frogs (Rana boylii). RIGHT: Male pacific treefrog in a small ephemeral breeding pool. A male Pacific Chorus Frog missing its rear right foot. Despite its wound, this male was seen frequently throughout the 2005 breeding season. I observe a few frogs each year with similar wounds. Many more frogs have scars on their back in the shape of the jaws of snakes. The breeding season is not just a time of fun for Pacific Chorus Frogs. A variety of predators will capture adult Pacific Chorus Frogs, including snakes and raccons. One common predator I have observed hunting breeding adults is the giant water bug, Lethocerus americanus (Benard 2007). 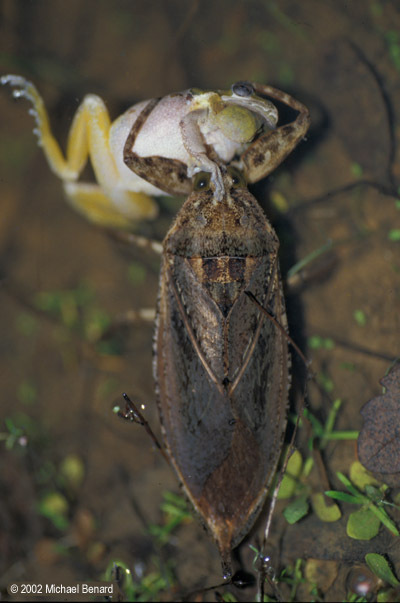 These enormous insects capture the frogs with their raptorial forelimbs, and use their piercing mouthparts to inject digestive toxins into the frogs. It turns out that the water bugs are more likely to catch big frogs than little frogs. 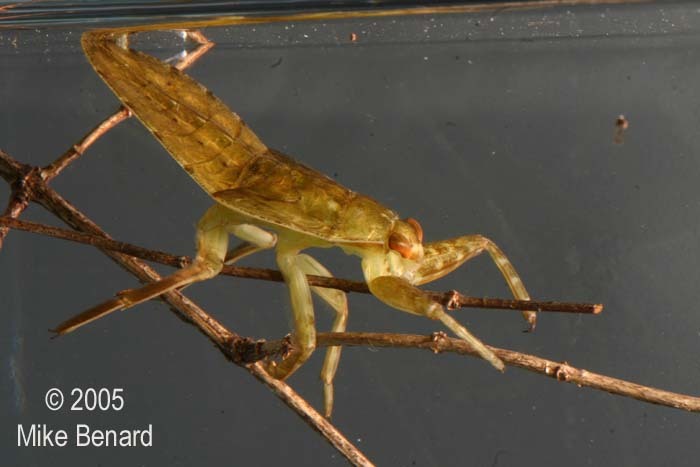 Giant water bug nymph, one of many predators on Pacific Chorus Frog tadpoles. 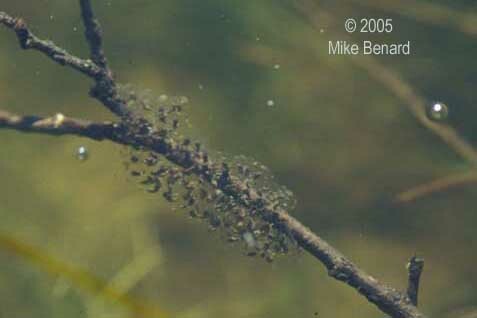 Pacific treefrog eggs may take several days to hatch. Upon hatching, the tadpoles are at risk from a host of predators that view Pacific Chorus Frog tadpoles as a tasty meal. These predators include birds, garter snakes, fish and predatory insects, among others. However, generations of evolution by natural selection has prepared the tadpoles for these threats. Tadpoles can detect chemical cues from these different predators, and initiate defensive responses that are specific to each kind of predator. 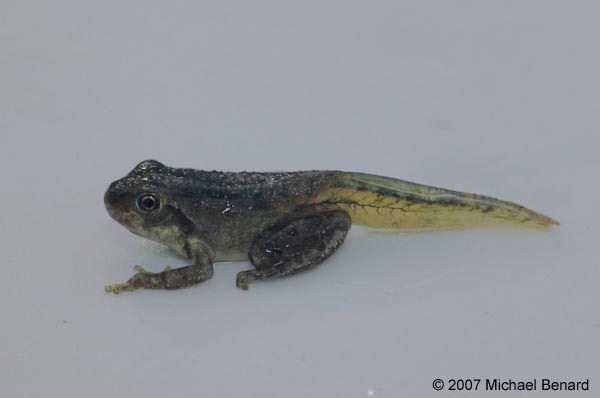 For example, Pacific Chorus Frog tadpoles develop enlarged tails when they smell predaceous diving beetles; these enlarged tails serve as a lure to distract strikes from the body of the tadpole toward the tail (Benard 2006). However, when tadpoles smell bluegill, they develop a shape that improves their swimming speed: shallow tails and deep tail muscles. These distinct responses to each type of predator represent adaptations to each predator's foraging strategy. Beetles are sit-and-wait predators, while fish can chase their prey for short distances. In the presence of predatory insects, tadpoles develop deep tails (top tadpole). In the presence of predatory fish, tadpoles have shallow tails (bottom tadpole). 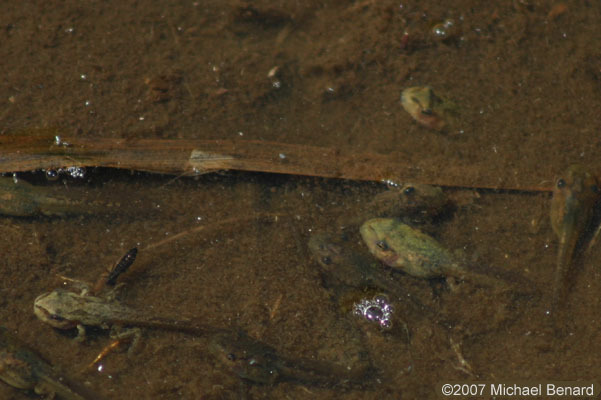 Tadpoles that are not exposed to cues from predators are intermediate in shape. Predaceous diving beetle larvae eating a tadpole. Predators are not the only threat tadpoles face. 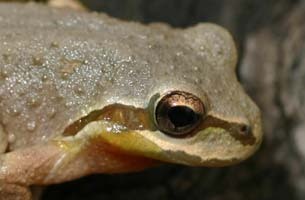 Because Pacific Treefrogs commonly breed in emphemeral ponds, a major source of mortality for tadpoles is pond drying. When these ponds dry early in the year, any Pacific Treefrog tadpole that cannot metamorphose into a small froglet will be killed. However, tadpoles have an adaptation to improve their chance of surviving in these ephemeral habitats as well. When Pacific Treefrog tadpoles detect that their pond is drying, they can accelerate their development rate so that they metamorphose earlier in the year. 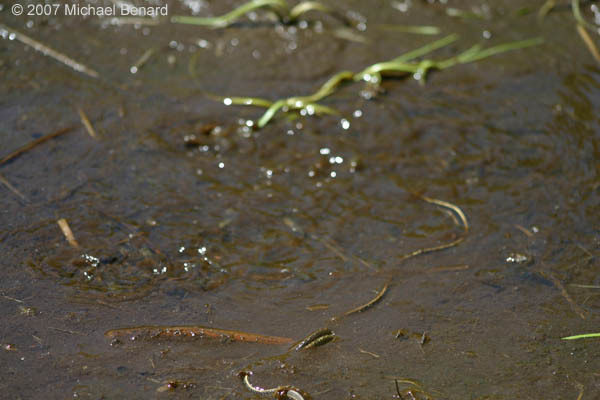 While this does not always save the tadpoles, it can improve their chances of survival in some ponds. LEFT: A recently dried pond. 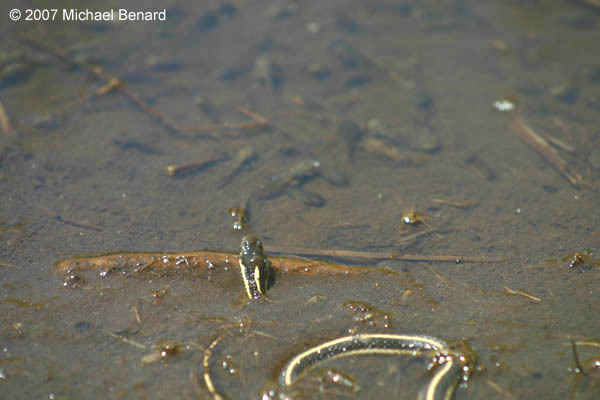 Metamorphosis allows pacific chorus frogs to escape the dangers of the aquatic tadpole stage. But metamorphosis is an awkward period in a frog's life. The metamorphosing individuals don't feed, as their mouths and digestive systems are being re-arranged. 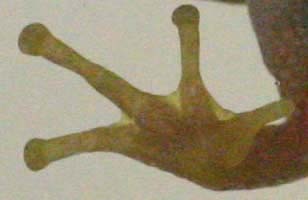 Their body shape includes both the tadpole's tail but also the adult's four legs. 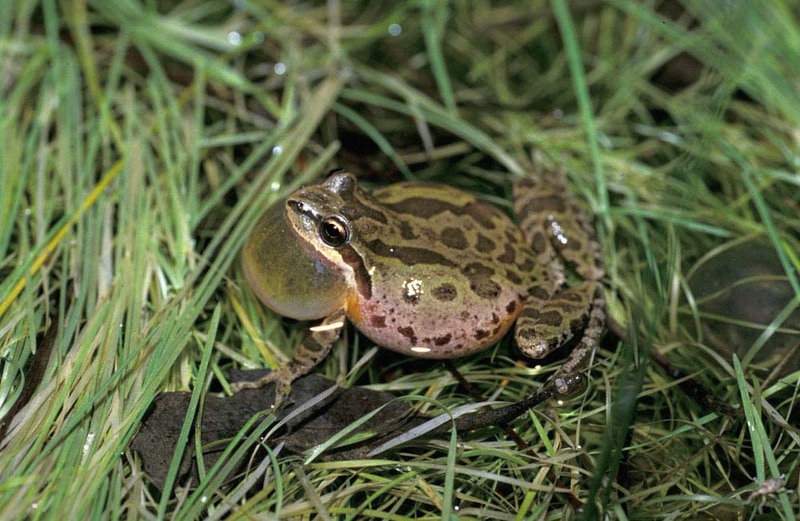 In a series of experiments on the closely related western chorus frog, Wassersug and Sperry (1977 Ecology) showed that metamorphosing frogs can neither swim as well as the tadpole nor jump as well as the adult. Consequently, the metamorphosing frogs are more vulnerable to predators. A subsequent study by Arnold and Wassersug (1978 Ecology) verified that this applies to pacific chorus frogs as well. 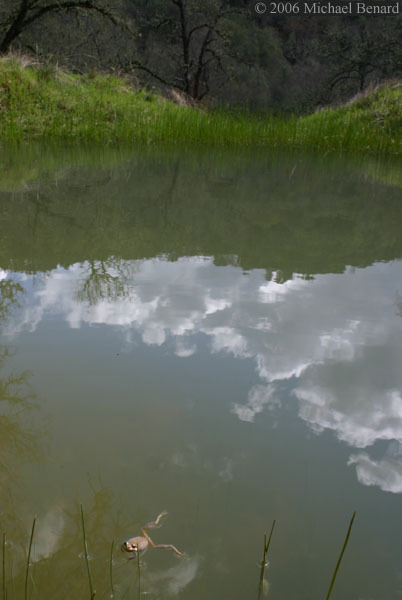 Arnold and Wassersug compared the abundance of tadpoles and metamorphosing frogs swimming freely in a pond, to the abundance of tadpoles and metamorphosing frogs found in snake stomachs. 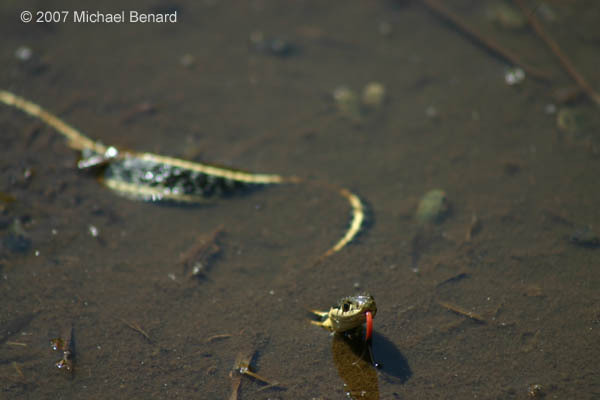 Although tadpoles were much more abundant in the pond than the metamorphosing frogs, the garter snakes had mostly eaten the metamorphosing individuals. Mountain garter snake (Thamnophis elegans), looking at a group of pacific treefrog tadpoles and metamorphs. The snake launches itself into a group, trashing around to capture and swallow its prey. The slowest and least maneuverable swimmers are most likely to be eaten. Its belly full of tadpoles and metamorphosing frogs, the garter snake prepares to leave the pool. Even long after metamorphosis, adult Pacific Chorus Frogs continue to be at risk of capture by a wide range of predators, including snakes, mammals and birds. Many of the most fascinating observations of predation on adult frogs comes from ornithologists. Michael Collopy provided an account of kestrels catching pacific chorus frogs and caching them for later use. He included an interesting description of a female kestrel that captured one frog and hid its body in a clump of grass before catching and killing a second frog. This second frog was hidden in the same clump of grass as the first frog. Another account was given by Gordon Alcorn, who found that pacific chorus frogs were a common prey item in the stomach of Western Red-Tailed Hawks. In fact, the stomach of one hawk contained 18 individual pacific chorus frogs! 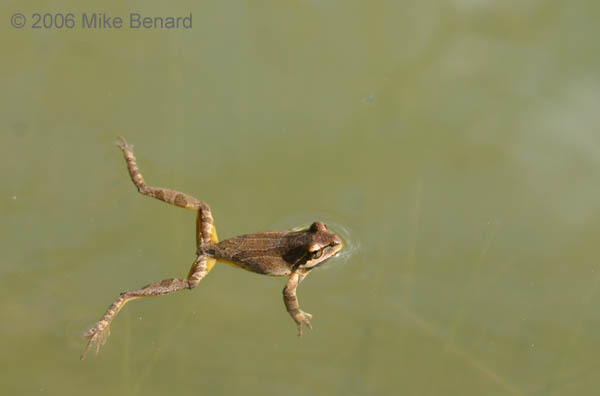 After the breeding season is over, the Pacific Chorus Frog disperse back into the habitat surrounding their pond. In many cases the frogs seek out holes and burrows where they can remain safe and moist underground. But some frogs will actually climb far up trees and live in Eagles' nests. There is little information on how far from their breeding pond the adults will move. However, I have observed a few individually-marked adults up to 300 meters from the breeding pond, and Jameson (1956 Copeia) noted frogs moving at least 260 meters from their breeding ponds. Both male and female pacific treefrogs will return to the same pond to breed. Some may live through as many as four breeding seasons. However, perhaps only 10-20 percent of the adults will survive from one breeding season to the next (Jameson 1956 Copeia). Over the last two decades, scientists and the general public have become alarmed by the rapid pace of extinctions of amphibians, called 'global amphibian declines'. While the pacific treefrog has remained abundant over most of its range, population-level declines have been observed in some areas. These localized declines are due to the introduction of new species, such as fish and bullfrogs, as well habitat destruction. If you would like to help protect amphibians like the pacific treefrog, one of the best ways to do this is through protecting habitat. Two simple ways to do this are to support legislation such as the Endangered Species Act, and to contribute to organizations such as land trusts (e.g.,The Land Trust Alliance or The Nature Conservancy) that protect habitat. A 2009 news story brought attention to an interesting way through which Pacific Chorus Frogs being introduced outside of their native range: hitchhiking from Oregon to Alaska inside of Christmas trees . Another example of frogs hitchhiking in trees came to my attention in Christmas 2014. This is not the first time that Pacific Chorus Frogs and other amphibians have been found to be transported in Christmas Trees and other horticultural products; for instance, Christy et. al (2007 Diversity and Distributions) report on Pacific Chorus frogs being brought to Guam in Christmas Trees. 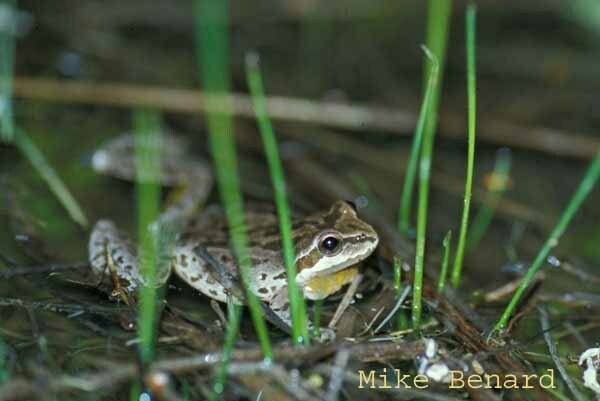 However, the observation of pacific chorus frogs hitchhiking from Oregon to Alaska raises the question of whether there is real potential for Pacific Chorus Frogs to become established in Alaska. There are already several cases of pacific treefrogs being established out of their native range. For instance, a population of pacific chorus frogs established in the Alexander Archipelago of Alaska in the 1960s was extant at least until 2002. However, it did not appear to have spread beyond a single lake, according to the S.O. MacDonald's "Amphibians and Reptiles of Alaska". In contrast, Reimchen (1991 Canadian Field Naturalist) reported on his studies of Pacific Chorus Frogs introduced to the Queen Charlotte Islands, British Columbia. The Pacific Chorus Frogs on the Queen Charlotte Islands spread at a rate of approximately 2 km per year. While the Queen Charlotte Islands are considerably south of Juneau, the islands are also north of the natural geographic range of these frogs. This suggests that Pacific Chorus Frog populations introduced to Alaska may be capable of increasing in size and spreading. You may see these frogs referred to as either "Pacific Chorus Frogs" or "Pacific Treefrogs". The appearance of these two names hints at the debate among biologists about the relationship of Pacific Chorus Frogs to other North American frogs. The key question of the debate was whether Pacific Chorus frogs are members of the tree frog group (genus Hyla) or members of the chorus frog group (genus Pseudacris). 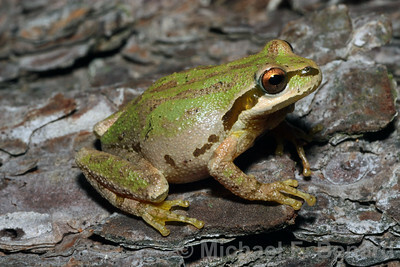 Members of the genus Hyla include species like the gray treefrog (Hyla versicolor) and the green treefrog (Hyla cinerea), whereas members of the genus Pseudacris include species like the spring peeper (Pseudacris crucifer) and the western chorus frog (Pseudacris triseriata). When pacific chorus frogs were first described by Baird and Girard in 1852, they were placed in Hyla. The genus Pseudacris had been described nine years earlier, by Fitzinger in 1843. Through the following decades, the pacific chorus frog continued to be considered a tree frog (Hyla), as shown in Cope's 1889 The Batrachia of North America, and in Stejneger and Barbour's 1917 A Check List of North American Amphibians and Reptiles. Over time, biologists began to note characteristics in which pacific chorus frogs were more similar to Pseudacris than Hyla. A neat example of this comes from Wright & Wright's 1933 Handbook of Frogs and Toads in which they state "This species reminds the authors of species of Pseudacris." Hedges (1986 Systematic Zoology) has a nice summary of some of these traits. For example, characteristics of Pseudacris include (1) round testes with a dark membrane, (2) small toepads, and (3) breeding occurring during cold weather (i.e., in winter or early spring). In contrast, Hyla have (1) elogate pale-colored testes, (2) large toepads, and (3) breeding occurring during warm weather (i.e., late spring or summer). 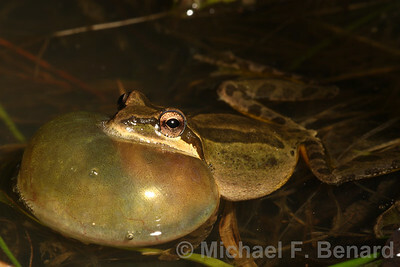 Pacific chorus frogs have dark testes and are cold-weather breeders, and their toepads are intermediate in size between other Pseudacris and Hyla. Even with the identification of some traits that linked pacific chorus frogs with the genus Pseudacris, it took time for enough evidence to accumulate to convincingly determine the affinity of pacific chorus frogs. The accumulating evidence included morphology, allozymes, nuclear sequence data and others (e.g., Hedges 1986 Systematic Zoology, Cocroft 1994 Herpetologica, Moriarty & Cannatella 2004 MPE, Pyron & Wiens 2011 MPE). All of these data now convincingly show that Pacific Chorus frogs belong in the genus Pseudacris rather than the genus Hyla. Thus, it is appropriate to refer to them as "pacific chorus frogs" instead of "pacific tree frogs."